The lack of a strong recovery since the 2007–08 financial crisis has been a central theme of many economic discussions over the past decade. We might normally expect an especially deep economic contraction to be followed by an especially strong recovery. Why was this recovery different? One of the more widely cited causes of the slow recovery has been a surplus of homes left over from the boom. How bad was the supply overhang? Surprisingly, the answer may be that there never was one. We can think about this in terms of stock (the number of homes in the United States) or flow (the rate at which new homes were being built). In terms of stock, the Census Bureau maintains estimates of both US population and the number of housing units. As shown in figure 1, the ratio of homes to adults in the United States rose in the 1980s as a result of factors such as changing marriage norms. The ratio then declined in the 1990s. The relative number of housing units increased somewhat from 2000 to 2005 but remained below the previous peak level. After the crisis, the decline continued. Note: There was a significant revision in the housing unit count after the 2000 Census, which causes a discontinuity in the measure. Also, the Census Bureau has produced a revised measure in table 8a (see source) for the years from 2000 to the present, so I have replaced the estimated counts from 1994 to 2000 with a linear trend (shown as a dotted line) connecting the previous decennial census revision to the earliest date with the new revised measure. The total rise in the ratio of units during the boom and the peak level of units in 2008 are similar in both the count from table 8 (see source) and the revised measure in table 8a. 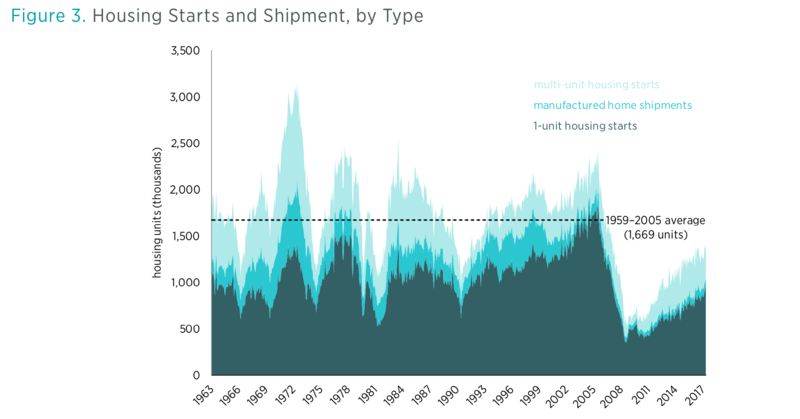 With either measure, the growth in housing units during the boom is mild, and the peak level of units remains below the estimates of the early 1990s. In terms of flow, the Census Bureau measures the construction of several forms of housing. Figure 2 shows the rolling five-year level of new housing starts (including manufactured homes, homes in multi-unit properties, and single-family homes) compared to total population growth (light blue line) and compared to adult population growth (dark blue line). The rate of housing starts was not unusual by either measure during the 2000–2010 period, and has since moved well below long-term norms. Figure 3 stacks the numbers of new housing units started or shipped over time. Single-family homes, at the bottom, make up the bulk of new housing units. Manufactured homes and multi-unit homes, which make up a relatively small portion of new housing units, stack on top. The horizontal dashed line shows the average number of new units built annually from 1959 to 2005—just before the crisis. When including all types of units, this measure also suggests that nothing out of the ordinary was going on before the financial crisis. The number of housing units added during the boom was only slightly above the long-term average. The Census data provide surprisingly little support for the claim that there were too many homes in 2005. Figure 3 provides a couple of hints about how policymakers came to believe that housing supply had been excessive and why, in fact, supply has actually been constrained. The number of single-family home starts, especially single-family homes built for sale, did rise to unprecedented levels. That is a high-profile category, where publicly traded homebuilders operate and where many families become new homeowners. But the other categories were either stagnant or in decline over the long term. The growth in single-family homes built for sale came mostly by taking market share from the other types of units. What caused this shift? The other categories face increasing regulatory hurdles: most notably, obstacles to housing expansion in several urban centers where many multi-unit properties would normally have been built. Another way to measure the growth in the housing stock is to measure real expenditures on housing over time. Figure 4 shows the long-term annual growth in real housing expenditures (dark blue line). 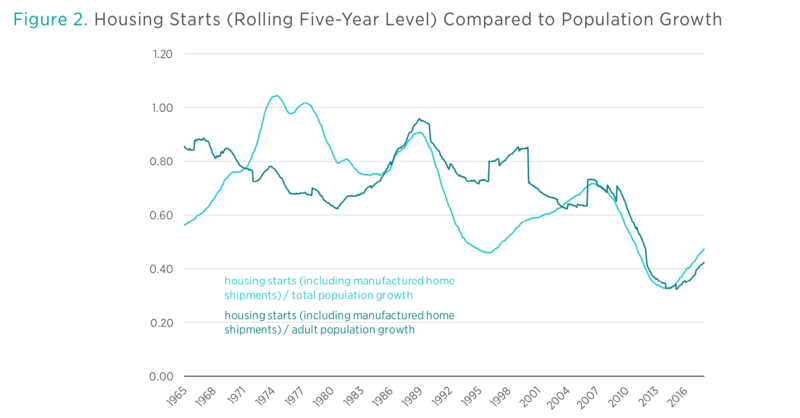 Housing consumption has been increasing more and more slowly over time. 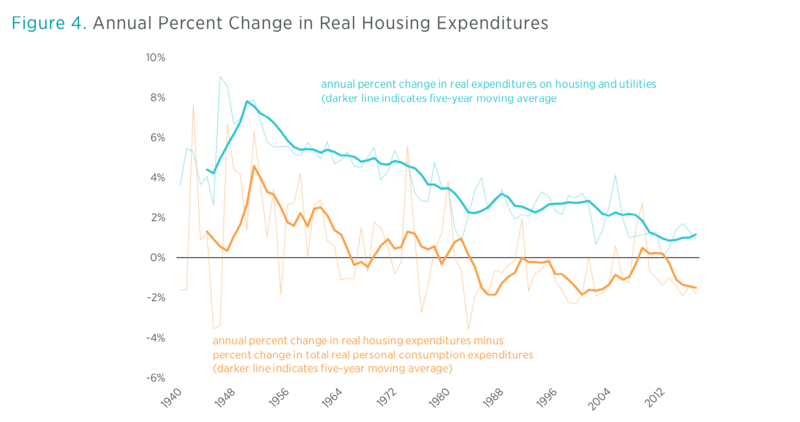 The dark orange line measures the growth in real housing expenditures minus the growth in total real spending. This raises the question, Was real consumption of housing growing more quickly than real consumption in general? As real income increases, is housing a larger portion of the new basket of goods and services or a smaller portion than it had been before? Households have been increasing their consumption of housing more slowly than they have increased their consumption of other goods. The idea—frequently claimed—that there was a housing bubble in the 2000s that was the result of Americans “keeping up with the Joneses,” buying trophy houses or overinvesting in new homes in a misguided attempt at saving or speculating, is wrong. Americans have been doing the opposite. That said, the portion of the average household’s budget going to housing each year has remained level. In 1984, housing comprised 18 percent of total personal consumption expenditures, and in 2017 it still comprised 18 percent. American households have been spending a stable amount of their incomes on housing for decades, but they keep getting less and less house for it. 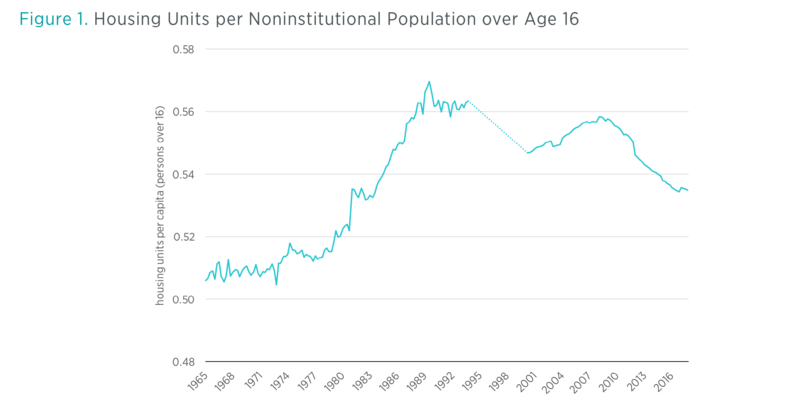 Since 1995, the rate of inflation on shelter has averaged 0.75 percentage points higher, annually, than the rate of inflation on other consumption items. For the last few decades, when Americans’ incomes have risen, their homes have only improved slightly, but their rents have increased more. Americans have had to limit their consumption of housing in order to try to keep their housing expenses at a comfortable level. We have been engaged in the opposite of overbuilding. Just a few cities are at the heart of the housing supply problem, most notably New York City, Los Angeles, Boston, and San Francisco, which I refer to as Closed Access cities. There are two very different housing markets within the United States: the Closed Access market, where new housing is highly constrained, rents rise relentlessly, and households are forced to make difficult choices as housing expenses eat up their budgets; and the rest of the country, where homes can generally be built to meet demand, housing construction is healthy, and housing expenses remain at comfortable levels for the typical household. If we add these two markets up into an aggregate market, it looks like a market where rents are relatively level over time. In the 2000s, when housing starts were rising and home prices were also rising to unusually high levels, it appeared as if those rising prices were unrelated to rent, and it appeared that prices were rising at the same time that supply was rising. This pattern, rising prices and quantities, seemed to be the result of excess demand—too much credit and too much money funding too much housing. Yet few places fit that description. For the most part, there were places where housing starts were low, while rents and prices were both rising, and there were places where housing starts were healthy, while rent and price increases were moderate. If we compare median annual rent and median home price within each metropolitan area, it is clear that rents were an increasingly important determinant over the past two decades of home price differentials between different metropolitan areas. And as shown in figure 5, in this regard, the Closed Access cities have become outliers—much higher rents leading to much higher prices. Closed Access cities have become outliers in terms of rent and price because they have also become outliers in terms of new housing construction and income. Figure 6 shows a similar pattern as figure 5. Over the past two decades, these cities have seen their incomes rise well above the national average. Even more surprisingly, as their incomes have risen, the portion of those incomes that goes to rent has increased. For typical households in the Closed Access cities, incomes have become much higher than incomes in other cities, but the extra income goes to rent. The Closed Access cities have become new centers of prosperity, but they have limited the growth in their populations through restrictive zoning and bureaucratic obstacles that make it difficult to build housing. This has turned them into enclaves of privilege, only open to the richest newcomers, who spend nearly half their incomes on rent. This pattern has only developed since the 1990s and is neither normal nor natural. From 1996 to 2005, across the United States permits were issued to build 6.5 homes per 100 residents. The Los Angeles, Boston, and New York metro areas each approved fewer than 2.6 per 100 during that time. San Francisco approved 3.4. In contrast, other economically prosperous cities that attract aspirational families in search of economic opportunity, such as Washington, DC, Seattle, and Dallas, issued permits at rates higher than the national average. Contrary to Chairman Bernanke’s assumption, at the national level there was no overhang of housing supply that needed to be worked off in 2011. Indeed, even in 2005 there was no national oversupply of housing. Rather, the American economy was burdened by a shortage of housing, especially in the Closed Access cities. The housing bubble was concentrated in cities in the coastal Northeast, California, Nevada, Arizona, and Florida. Limiting our analysis to the 20 largest metropolitan areas, the Closed Access cities make up three-quarters of the “bubble” cities, in terms of total real estate valuation. Constrained housing supply was clearly the primary source of high prices in those cities, not excess demand. Prices in the Closed Access cities today remain as high relative to other cities as they were during the bubble because constrained supply is the fundamental reason for those high prices, not reckless credit markets. Even in other bubble cities with generous building policies, the primary cause of rising prices was the severe Closed Access shortage of housing. 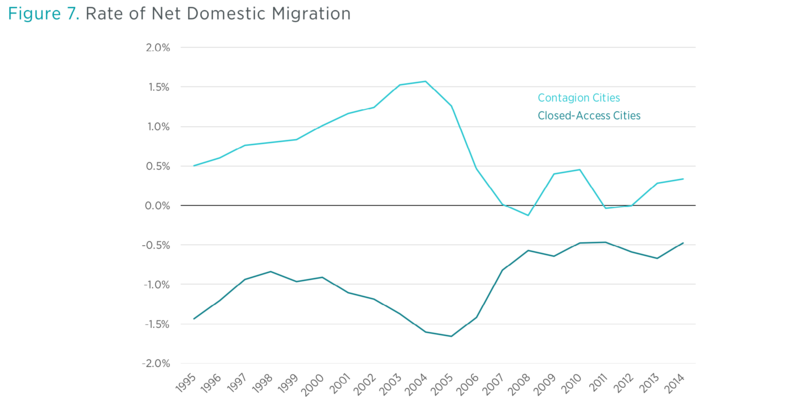 This is because those other bubble cities were the main destinations for households migrating out of the Closed Access cities. I call those cities Contagion cities, because in spite of their more generous building policies, they were overwhelmed by the problem created by the Closed Access cities. In the years leading up to the financial crisis, the shortage of housing in the Closed Access cities had become so severe that each year hundreds of thousands of households moved away in search of an affordable home. Many of them landed in inland California, Nevada, Arizona, and Florida. For many people, it seemed obvious that there was overbuilding in places like Phoenix. From 2003 to 2005, Phoenix built many homes. Meanwhile, prices of Phoenix homes rose by about 75 percent in just two years. By 2007, however, the Phoenix housing market was collapsing, buried in a mountain of unclaimed inventory. Surely, it was argued, this was a classic credit-fueled boom and bust. But, for the boom-and-bust story to add up, Phoenix would have had to build enough homes for all of those new households moving in from California, and then it would also have had to build tens of thousands of units in addition to that. It couldn’t. The problem Phoenix encountered was that the in-migration was so strong that even Phoenix authorities couldn’t approve new supply fast enough to meet demand. Building permits in Phoenix jumped by about 50 percent from 2001 to 2004. 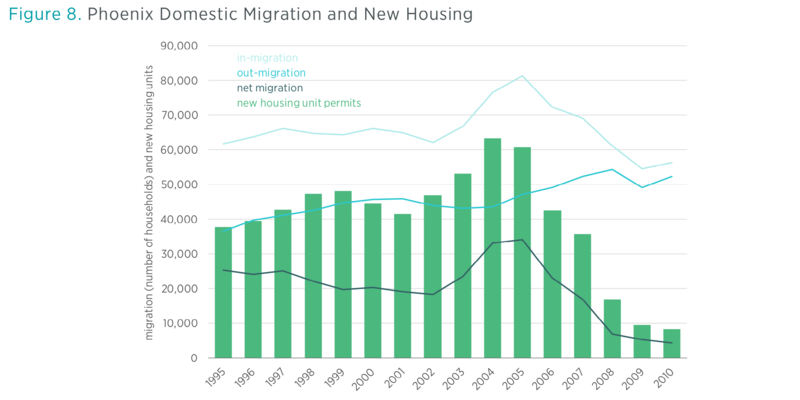 By all appearances, that is an extremely frothy market, but as figure 8 shows, the jump in new homes tracked virtually 1:1 with net in-migration. Many of those in-migrants were coming from California. They were moving to Phoenix largely to reduce their housing expenses. In fact, even though migration from California had continued to rise up through 2005, net migration into Phoenix had leveled off. That is because increasing numbers of households now began moving away from Phoenix, which had seen soaring home prices. From 2005 to 2008, migration into Phoenix declined each year while migration out of Phoenix continued to rise. By 2008, net in-migration into Phoenix was less than 10,000 households. By 2006, Phoenix had a growing number of empty homes and a large inventory of homes for sale. But from 2005 to 2008, the number of new homes approved in Phoenix dropped faster than net migration was dropping. Housing supply had reacted remarkably quickly to shifting demand. Even as housing starts were collapsing, rents were rising, as they were in most cities at the time. Furthermore, housing vacancies in Phoenix followed an interesting pattern. 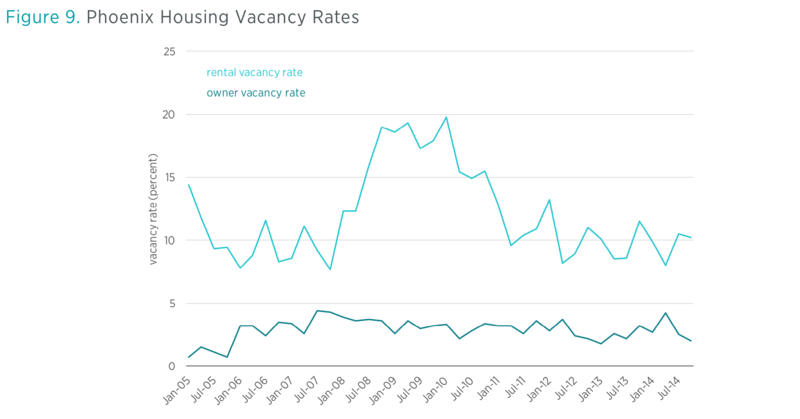 As figure 9 shows, vacancies among owned homes rose in 2006, but vacancies among rentals remained stable until 2008. In most other cities, there wasn’t a systematic shift in vacancies. This pattern is mostly limited to the Contagion cities that had been exposed to Closed Access migration events. There were plenty of tenants for the housing units that existed in 2006. What those housing markets lacked were buyers. There was not an oversupply of homes in Phoenix. There was an undersupply of buyers. By 2008, when rental vacancies rose, the problem was that a decades-long flow of migration had suddenly dissipated to a dribble. The question that needs to be addressed about the housing bubble and the ensuing bust is not what caused prices to rise so sharply. That is a fairly straightforward question, with a standard economic answer. Fundamentally, there weren’t enough houses. What caused the massive out-migration from the Closed Access cities? The answer to that question is also, fundamentally, that there weren’t enough houses. This leaves one additional question that has been rarely asked, and which must be answered if we are to come to terms with the crisis that followed. If a lack of housing was fundamentally the cause of the housing bubble, then why had housing starts been collapsing for more than a year before the series of events occurred that we associate with the crisis, like nationally collapsing home prices, defaults, financial panics, and recession? And what caused the Closed Access migration event to suddenly stop at the same time as the collapse of housing starts? For a decade, the collapse has been treated as if it was inevitable, and the important question seemed to be, What caused the bubble that led to the collapse? This needs to be flipped around. Given the urban housing shortage, it was rising prices that were inevitable. So the important question is, Why did prices and housing starts collapse even though the supply shortage remains? And why were housing starts still at depression levels in 2011? The surprising answer to those questions may be that a housing bubble didn’t lead to an inevitable recession. It may be that a moral panic developed about building and lending. The policies the public demanded as a result of that moral panic led to a recession that was largely self-inflicted and unnecessary. They also led to an unnecessary housing depression that continues to this day.